St. Ives is the older brother to the nationally celebrated Tullymore Golf Club. (You can read my review of Jim Engh’s Tullymore masterpiece here). 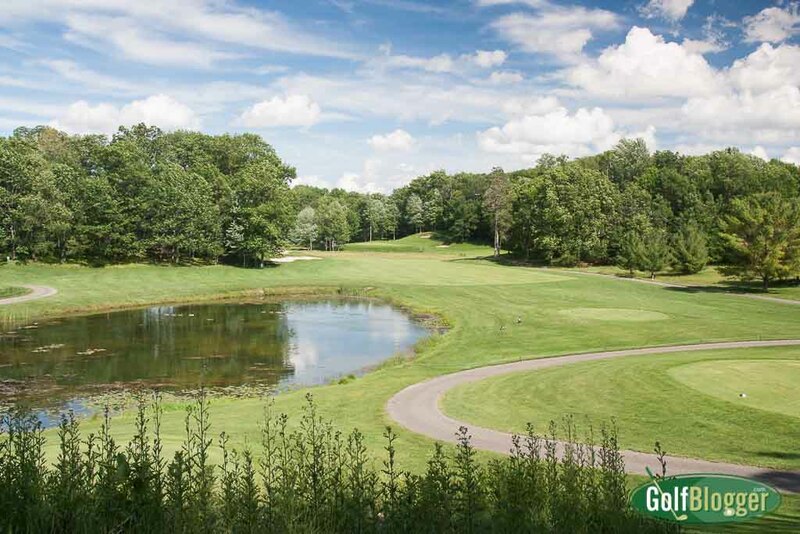 While not nearly as nationally famous, St. Ives is a fine course in its own right. 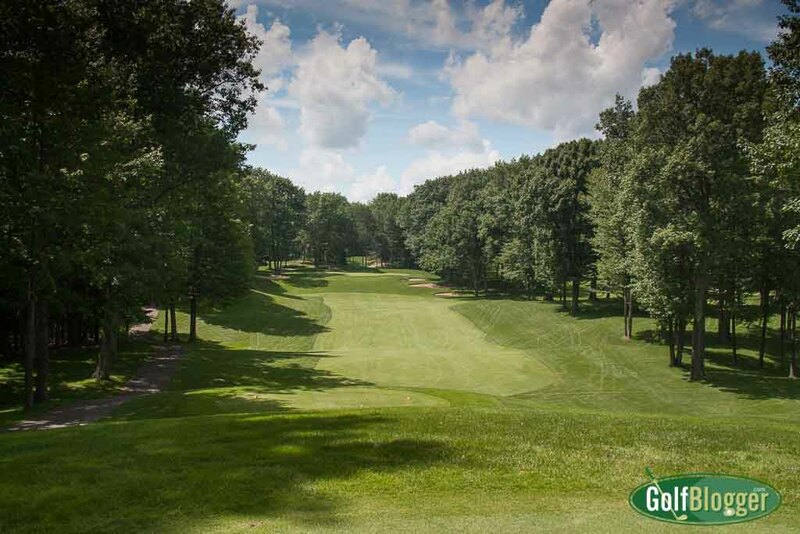 In the design of St. Ives, Jerry Matthews featured all the things I love about the best of Michigan golf: cathedral-like trees, wide fairways, significant elevation changes and a sense of splendid isolation on nearly every hole. From the tips, St. Ives stretches to 6,702 where it plays to a 73.1/146. The white tees come in at 5,707 and play to a 68.9/127. After looking at the lengths of the par fours, I decided to play the blue, which measures 6,247 and plays 70.8/139. The longest par 4 is 415 yards, and six of the ten are 365 or shorter. For me, the par 4s dictate the tees that I play. Most of the holes are relatively straightaway affairs, relying upon elevation changes — especially to the greens — to protect par. Six of the holes were doglegs left of one degree or another, while two turned right. Water came into play on seven holes, and I counted some twenty five sand traps. 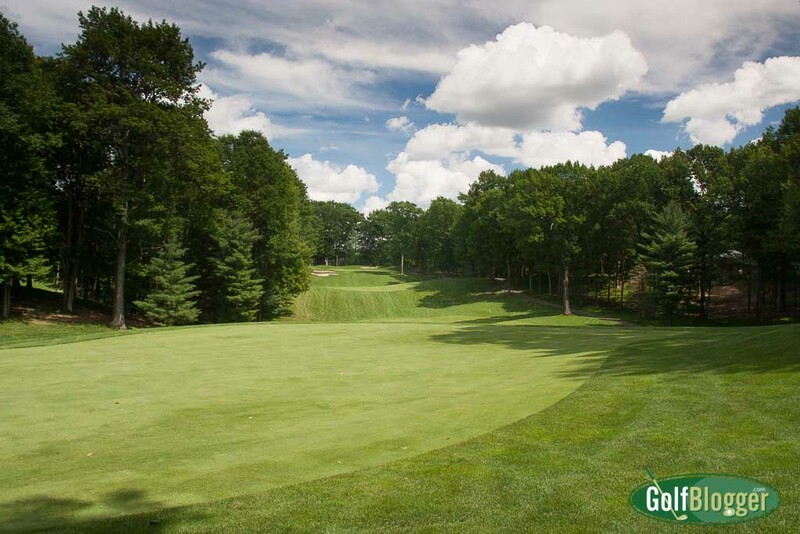 As with so many great Michigan courses, playing St. Ives is an exploration. Each hole stands on its own, allowing play without distraction. As you finish with one hole, a short stroll or drive through shadowed woods closes out the one world, until at the next tee another fairway opens before you. And on it goes from light to darkness and back into the light. The only spot at St. Ives where holes are really visible to one another is from sixteen to seventeen — and even then, because sixteen is an island par three, it doesn’t feel like much of an intrusion. The second shot for St. Ives’ par five seventh. My favorite hole at St. Ives was the par five seventh. 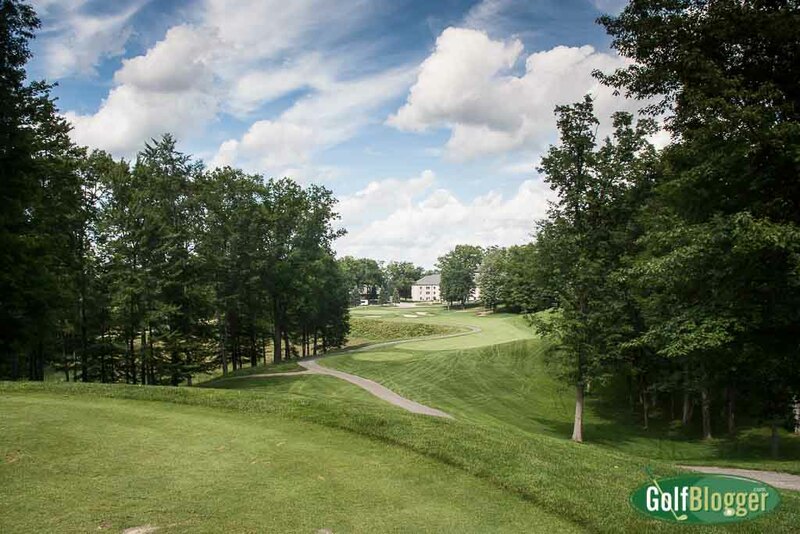 It’s a 438 yard dogleg left consisting of a series of plateaus at different elevations. From the white tees, a draw or hook of around 200 yards will put you on the first plateau. Depending upon how far you hit, or if you get a good kick and roll (as I did), your next shot will require some consideration. The green is potentially reachable, but given the elevation will need an extra club. You could lay up to the bottom of the next landing area and then try to take a shot at the green. Or you could shoot the ravine toe the landing area set hard against the hill about 60 yards from the green. So many options and a thrill ride of a hole. St. Ives par 4 ninth. Another great hole was the par four ninth. Measuring just 315 from the blue tees, it’s a dogleg left from an elevated tee. There are several options here. A player could try to keep the ball to the right for a shorter and safer tee shot, but a longer approach. Moving left increasingly shortens the second shot, while increasing the risk of losing the ball in the fronting waste areas. If the ball drops in the depression, you’ll be teeing it up for shot number three. I’ll also mention the sixth at St. Ives because I darn near holed out for an Eagle. It’s a 324 yard downhill par 4, with reachable bunkers on the right. I hit by far my best drive of the day straight down the middle, then stuck a wedge to within half a rotation of the ball. It’s a shame I didn’t sink it, because I really could have used the two shots to offset my disaster at fourteen. The fourteenth (photo at the top of the page) deserves special mention because it is absolutely brutal. It’s a 435 yard par 4 that starts over a lake. The landing area is narrow, and just 125 yards or so long. Overcook the tee shot and you’ll end up in impenetrable marsh at the end of the fairway. But if you don’t hit it far enough, you’ll have a very difficult long iron or wood to the green. 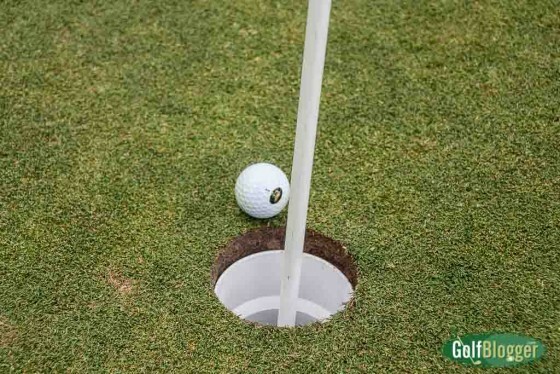 Even in the best case, the shot to the green will be 150 yards or so — and take an extra club. To make matters worse, the green is not particularly large. Matthews provided a bail-out for the second shot, though it’s not a particularly good one: there’s a narrow strip of fairway short of, and to the right of the green. I hooked my ball into the bunkers on the left side of the landing zone, had to pitch back to the fairway, was still too far to take a shot at the green, tried to bail out right, but overshot that fairway, pitched back to the fairway, left a wedge to the green short, chipped on and one-putted. A seven. Conditions on the day I played St. Ives were excellent. Fairways and greens were full and smooth. 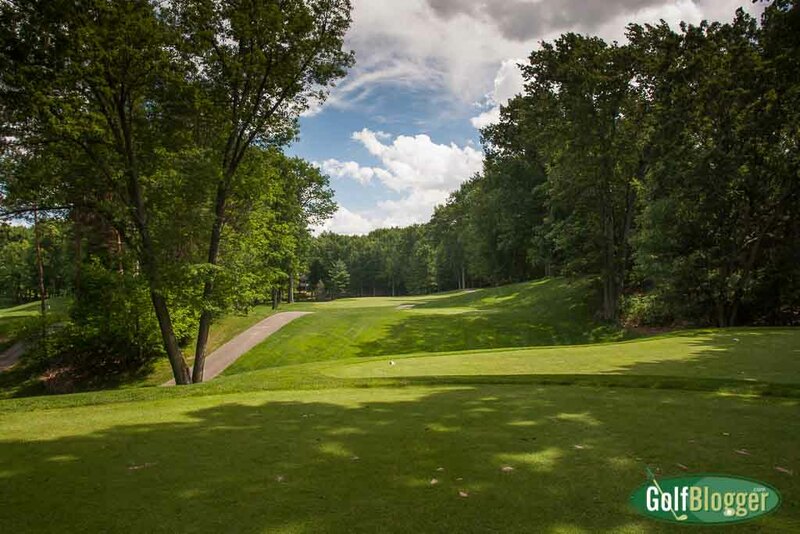 There a couple of low lying wet areas, especially on fourteen through seventeen, but since it has been an unusually rainy June in Michigan, I am willing to give the groundskeepers at St. Ives the benefit of the doubt. My one disappointment with St. Ives was that it is largely un-walkable . It is not so much the distance between the holes as the steepness of the paths and fairways. There were several places where I was not entirely certain that the cart would make it up the hill. Nonetheless, a ranger told me that there are people who walk the course. Apparently regulars learn the shortcuts that bypass the worst spots. St. Ives is not cheap. Peak summer greens fees are $100 during the week, and $125 on the weekend. That’s about as expensive as anything gets in Michigan. In design and quality, I’d compare St. Ives to Black Lake (Onaway) or Black Forest (Gaylord), both of which are $25 cheaper on the weekdays. I’ve not played anything comparable in Southeastern Michigan, but in the Augusta area, you can play Stonehedge South for under $40. Stonehedge has a similar feel, but not the same conditions. St. Ives thus gets marked down a bit for price-value ratio. All that said, I’m glad I played, because St. Ives Golf Club was a terrific experience. The St Ives Golf Course review was first published July 1, 2015. What a nice pictures! The grass look like artificial grass! What a nice course.